Adobo is the process of cooking food in soy sauce, vinegar and other spices – a very popular Filipino food and is best eaten the day after it was cooked. I use Balsamic Vinegar for my Adobo because of it’s rich and complex flavor with hard-boiled eggs or quail eggs. Whichever is available in my fridge. I also make it a point to have ripe bananas when we have Adobo. 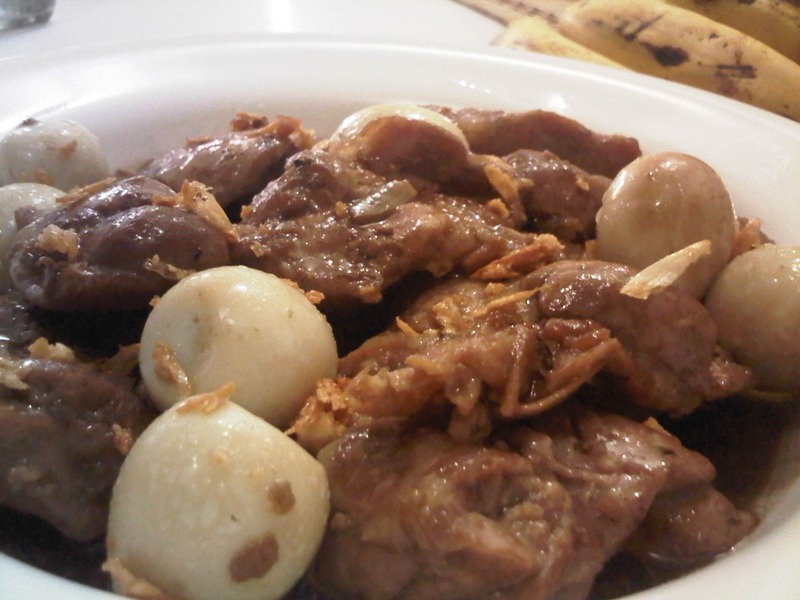 The sour taste of Adobo compliments the sweetness of the banana. Below is my version of Chicken Adobo using Balsamic Vinegar. *Coat the pan with olive oil and sauté the garlic until golden brown. Set aside a small amount of toasted garlic for garnishing. *Place the chicken and fry until it turns brown. Remove then set aside. *Boil soy sauce, bay leaves, water, white vinegar, brown sugar, salt and pepper for about 5mins on low fire. *Put back the fried chicken breast fillet and let it simmer. Add balsamic vinegar towards the end of cooking and boil once to retain it’s rich flavor. *Add the hard-boiled or quail eggs before serving. Top with toasted garlic. *Serve hot with rice and ripe bananas. This post made me hungry! Tried this before when we were in Germany, the only vinegar we had in my aunt’s kitchen was balsamic. The outcome’s sooo yummy! First time here, will definitely come back. Love your header BTW. Thank you for dropping by and for liking my header! Apologies for the late reply, by the way.